Our OOT bags and contents! So much fun! Here you go. I will also try to tell details / price. Here is the bag with all the contents. 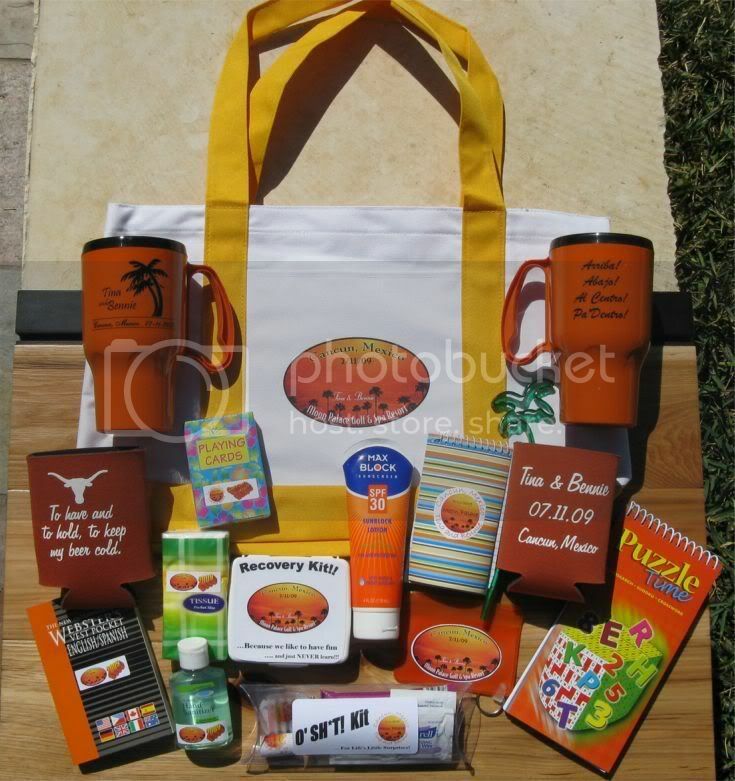 Total price with one of everything for singles = 18.69 , with two koozies/mugs for couples = $22.49 Includes approx $1.00 a bag for labels for everything. I bought things at assorted places. Some items I found in bulk from Ebay, some came from the dollar store, and some came from assorted online places. If you want specifics, pm me. It was fun going home each day to find out what new things had arrived. I bought the bags (600 denier waterproof with pocket - the logo put on with a professional heat transfer method - $4.29) from a lady in Austin. I also bought our koozies from her. She runs a bridal / advertising business. 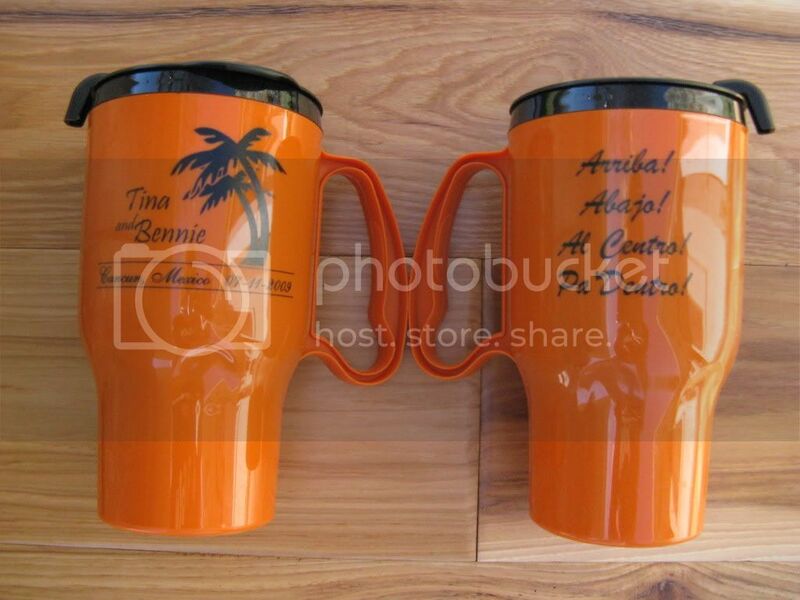 I bought the travel mugs from 4Imprint.com. I would still like to add something fun like water floaties or something but I hit our budget line (actually went over a bit!). I enjoyed it and am still putting labels on everything but wanted to share the results. I am glad it is close to being done so I can get onto other details. I love them!!!! They are super cute. 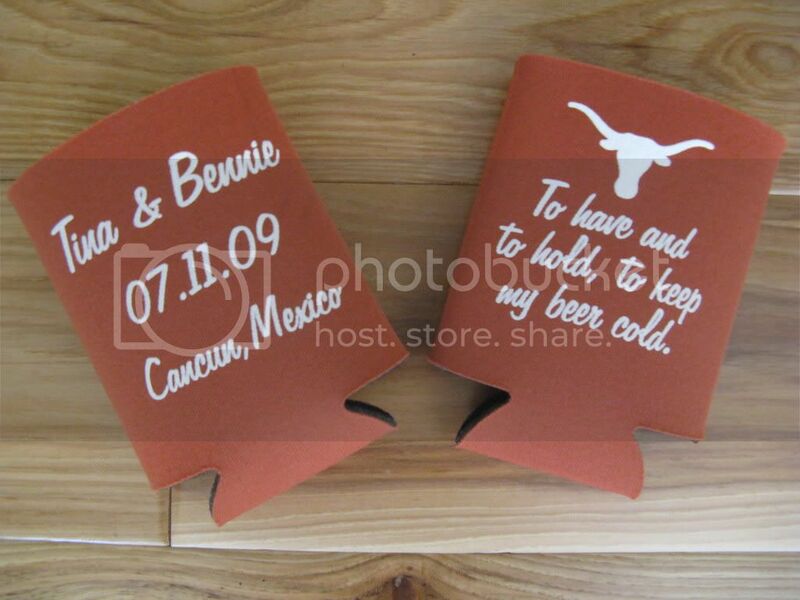 I especially love the hook 'em horns koozie. The mugs looks amazing too! Oops forgot to list items that were not mentioned earlier. I include the taxes and/or shipping paid in my prices. These are SUPER cute!! Your guests are going to love them! And i love your Oh Sh*t kit! that's funny, yet oh so perfect! LOVE the bags! Your guests will be very happy! Super cute bags I just told my FI how we are going to be doing OOT bags for our guests & it's the first thing wedding related that he has gotten excited about! He has been online searching for mugs for the past 2 days...and he did not find anything that I liked. I LOVEEEEE your mugs!! The burnt orange is one of my colors too so I am def going to be ordering them . 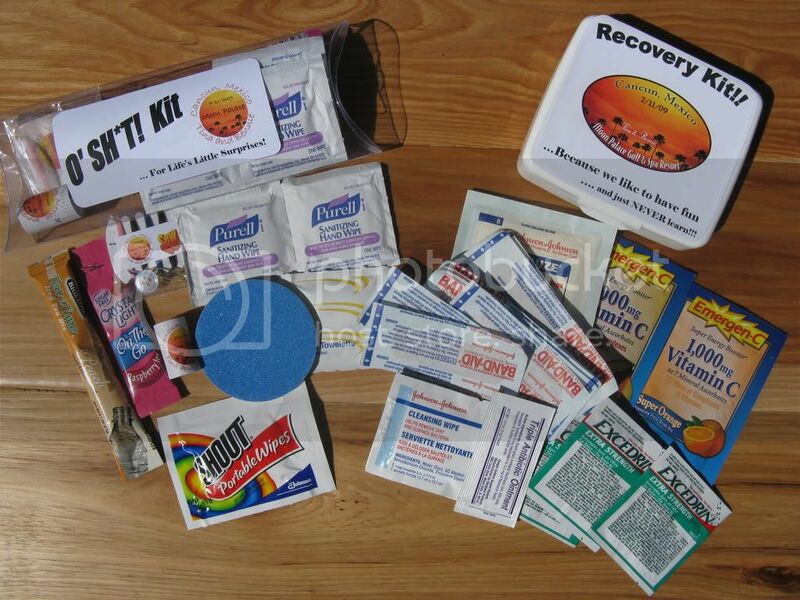 Did you just make the first aid kits or did you buy them premade? Everything looks very good with your monogram and all!!! Your guests are going to love them! Were you just going to leave the mugs in the shippiing box to take down there? The oh Sh*t kit is funny. Everything looks great! LOL Great OOT bags!! 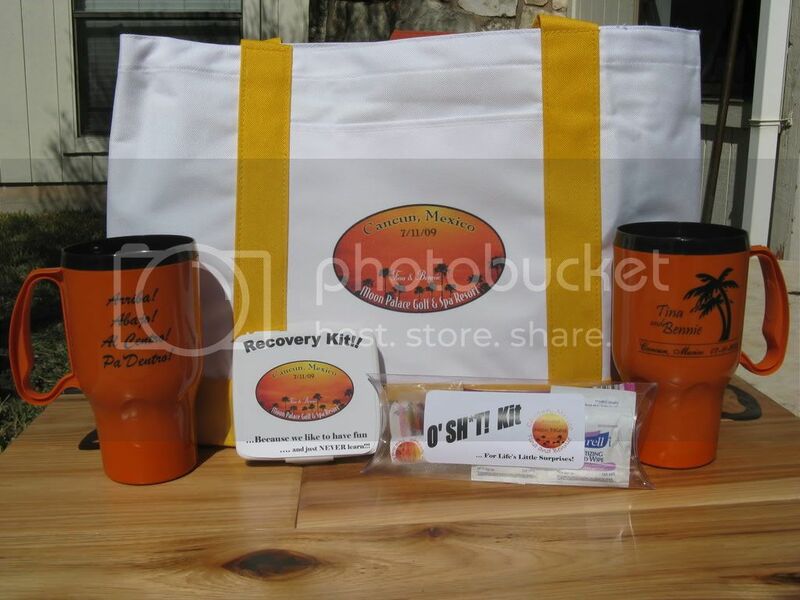 Too funny the Oh sh*t kit!! Very cute stuff! Your guests are going to love them!